One of the most thorough treatments of this region prior to the U.S. government surveys. United States of America Southern Part. 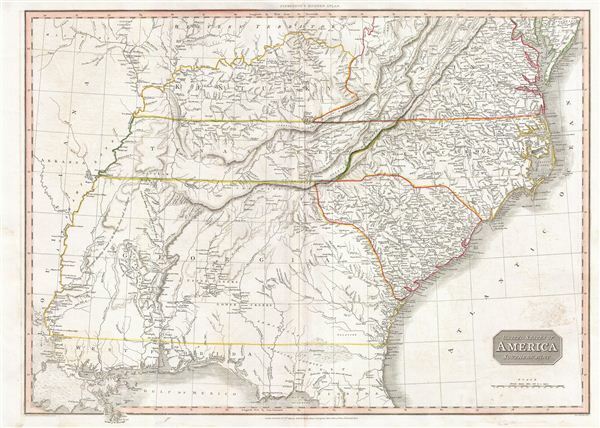 A scarce and important 1809 map of the southeastern part of the United States by John Pinkerton. The map covers from the Mississippi River eastward to the Atlantic, extending north as far as Delaware, and south to northern Florida and the Mississippi River Delta. The states of Virginia, Kentucky, Tennessee, North Carolina, South Carolina and Georgia are illustrated in full while Florida, Alabama, and Mississippi have yet to appear as either states or territories. Florida was not yet part of the United States but would join ten years after this map was printed in 1819. This map was created during the transitional period of expansion shortly following the American Revolutionary War and is among most thorough treatments of this region prior to the U.S. Government Surveys. This map is particularly interesting for its detailed treatment of American Indian activity between the Mississippi and the Appalachian Mountains. American Indian nations are noted throughout, including the Creek, Seminole, Apache, Choctaw and Chickasaw, among others. Hunting grounds, villages and fortifications are also identified, sometimes accompanied by the date on which they were destroyed. Pinkerton additionally identifies the Wabash Company, the Jersey Company and the Illinois Company - joint stock ventures formed during the colonial period to acquire, sell, and colonize American Indian lands. Pinkerton, John, A modern atlas, from the latest and best authorities, exhibiting the various divisions of the world, with its chief empires, kingdoms and states, in sixty maps, carefully reduced from the largest and most authentic sources, (London: Cadell & Davies, Longman Hurst Rees, & Orme) 1811. Very good. Original centerfold exhibits some wear and verso reinforcement. Ample margins. Blank on verso. Rumsey 0732.044. Phillips (atlases) 772.